Ten years is a long time. Jeez – I was still in my twenties. When they’re not out on the water experiencing the adventure of sailing, twenty-somethings love the adventure portrayed in a good, unrealistic action movie. Ten years ago, there were two new releases that rocked the summer of 2002. One was The Bourne Identity, the film adaptation of Robert Ludlum’s thrilling novel, starring Matt Damon. The other was WindCheck Magazine, starring (at that time) Long Island Sound Sailors. Our debut was slightly different than that of The Bourne Identity. There were no premiere screenings or press junkets. We didn’t hit the talk show trail, hyping up our latest project. We just showed up at yacht clubs, marinas, delis and chandleries. And with both came rave reviews. I won’t recap what we’ve done over the past three-thousand-six-hundred and fifty days of producing WindCheck. Since we celebrated our 100th issue less than a year ago, the ruminations of WindCheck experiences past, articles written and people encountered still linger fresh on all of our minds here in the office. But, one might think that working on the same subject, seven days a week for ten years might wear on someone’s enthusiasm. Not so with any of the crew at WindCheck…Although, while planning a family trip to Jackson Hole, Wyoming, I was actually looking forward to trading in my sea boots for cowboy boots for a week. Aside from the majesty of the Teton range and the awesome wildlife, the best thing I saw out West – and what got me the most pumped – was when I stopped into the famous Silver Dollar Bar at the Wort Hotel in downtown Jackson. While the bartender told us about the history of the joint, I noticed the sports section of USA Today laying a few feet away. 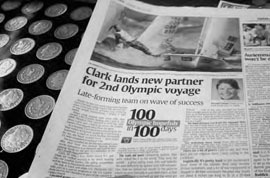 The article was about Amanda Clark and Sara Lihan – their ‘wave of success’ prior to the Olympics and their hope of bringing home the gold for Team USA! The story of the Silver Dollar Bar no longer held my fascination…and I didn’t even bother to turn to the entertainment section of the paper to see which movies were raking it in at the box office. I guess I’m not meant to escape the world of sailing – even nestled between two mountain ranges, and among cowboy boots, elk migrations and that dumb moose crunching at the birch tree outside my window. Heck, I’m glad to see our sport trickle into a place that I’d least expected it to be – kind of like a ten-gallon hat and spurs at a regatta tent party. It’s a breath of fresh air, even if it wisps down from a mountain and not the ocean. A decade later, the WindCheck and Bourne franchises are still at it. The Bourne Legacy is expanding their appeal with a new hero and cast of characters and plenty of action. WindCheck is increasing its appeal with the expansion of our coverage from Long Island Sound to locales further west, deeper south, stretching east and pushing north. I bet when twenty years rolls along, Jason Bourne and crew will have long holstered their guns and healed their wounds. What adventure will WindCheck be embarking upon? Whatever it happens to be, we hope you’ll be right there with us. Yee Haw – See you on the water.